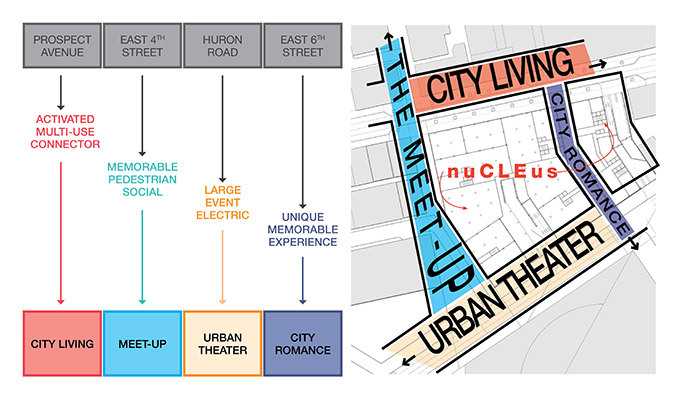 Located in the heart of downtown Cleveland, nuCLEus is ambitious mixed-use urban development that will contribute new energy to the city as it turns a corner in its economic and cultural resurgence. The project will offer approximately two million square feet of new space in the downtown consisting of retail, office, hotel, residential and parking program. 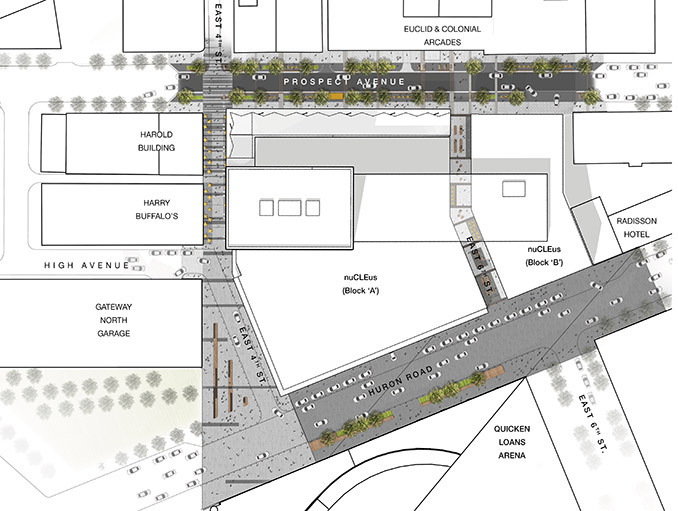 In addition this project will spur changes in the urban fabric through the redesign of streets making this district more pedestrian friendly, activated by the influx of new residents, workers and visitors drawn to nuCLEus and its invigorated neighbours. The architecture of this 54-storey development is iconic and already known to many as the Jenga Tower, a reference to the table game which tests ones skills in building structures with simple rectangular blocks. 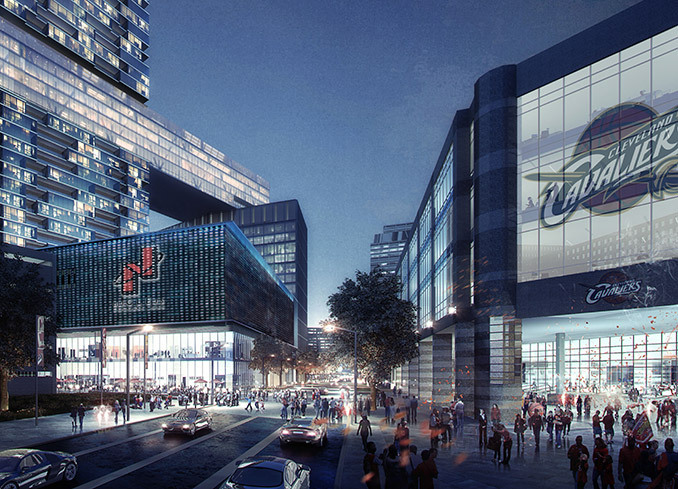 In addition this project will help enliven the adjacent Quicken Loans Arena (known as the “Q”) as well as the residential and entertainment streets at its edges. 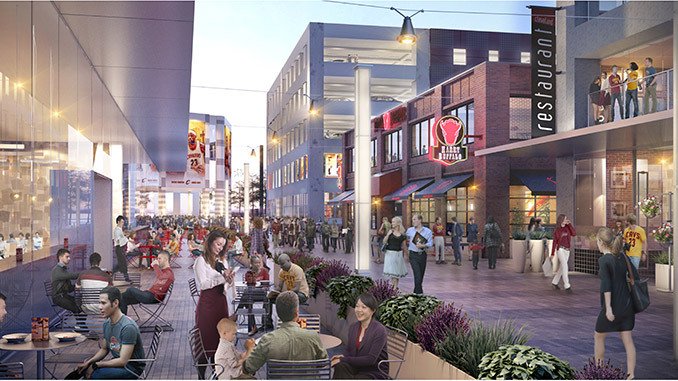 A variety of new retail and restaurant establishments will occur at the street level to activate these corridors on all four sides creating a series of unique spaces and places. 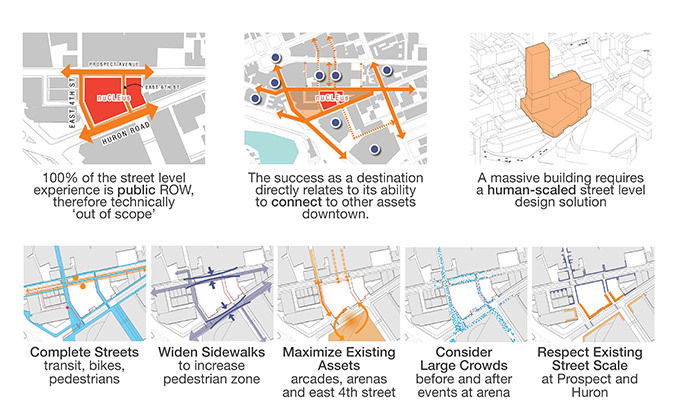 Each street edging the site is unique and will be designed to perform based upon its unique function as an urban corridor. Some streets will be narrowed, others will restrict vehicular movement and others will be enhanced to improved vehicular movement to maximize pedestrian and vehicular movement. The landscape architects are promoting “Complete Streets” principles in order to maximize the growth potential of new street trees, incorporate cutting edge storm water techniques and improve the pedestrian environment so that it is safe and equally attractive to pedestrians, cyclists and motorists. Looking beyond the grandeur of Terminal Tower, and its siblings that rose up to join it, we find the lives of Clevelanders played out in the streets. The early days of crowds flooding the original Euclid Avenue; The tight-knit intricacies of old immigrant enclaves; The nostalgic Corner of Carnegie and Ontario; The newfound joy of today’s East 4th; The neighborhood pockets of Ohio City, Little Italy, Cedar-Lee, Old Brooklyn…and all the hidden places that an outsider might never begin to know. These streets are where lives clash and converge, and these streets are where communities – cities – are defined. 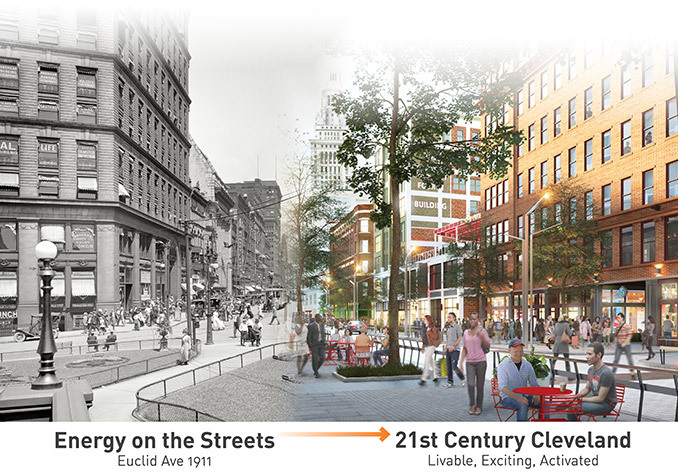 Cleveland’s public realm is where we can leverage the greatest possible impact, and where we must act most sensitively to the existing urban fabric. 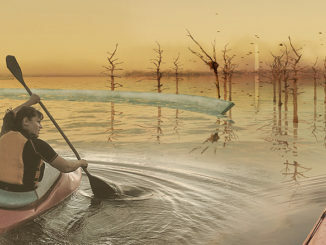 It is where we must push the boundaries of our project scope in order to inspire collaboration that goes beyond a singular vision. This city, after all, belongs to all who are willing to work for it. The opportunity here is four-fold – Prospect, East 4th, Huron, East 6th – and each charge is unique. But all are united by what they must do: bring life back to our downtown streets, for more than just a game, or a holiday, or a nine to five work day. The opportunity here is rare, but it must be more than fleeting. And it is our ultimate responsibility to make it last – to forge authentic staying power within the foundations of our urban core. 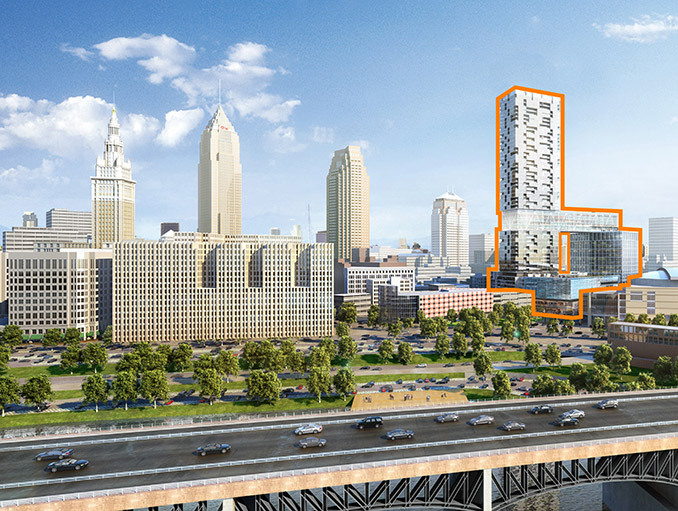 Our vision was to capture the opportunity for this development to forge a future for the rebirth of Cleveland from the foundations of a strong and storied past. To embed this historic identity within the new. 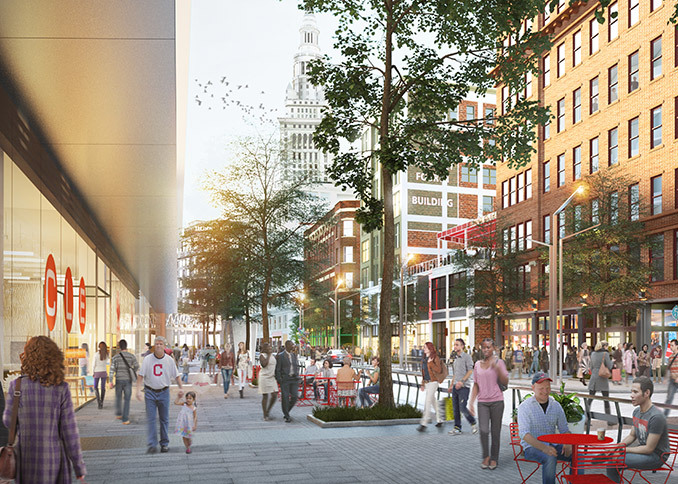 This project has the ability to create a catalyst for sustainable change which will inspire urban livability, connected neighborhoods, and continued development for the new 21st century in Cleveland.